The 2011 Hotan attack was a bomb-and-knife attack that occurred in Hotan, Xinjiang, China on July 18, 2011. According to witnesses, the assailants were a group of 18 young Uyghur men who opposed the local government's campaign against the burqa, which had grown popular among older Hotan women in 2009 but were also used in a series of violent crimes. The men occupied a police station on Nuerbage Street at noon, killing two security guards with knives and bombs and taking eight hostages. The attackers then yelled religious slogans, including ones associated with Jihadism, as they replaced the Chinese flag on top of a police station with another flag, the identity of which is disputed. After a firefight with police around 1:30 p.m., 14 of the attackers were killed, and four were captured. Six of the hostages were rescued alive, while two were killed in the attack. Local and national governments said the attack was organized terrorism motivated by religious extremism, and found that two of the attackers have links to the militant East Turkestan Islamic Movement (ETIM). A team from China's counter-terrorism office was sent to Hotan to investigate the attack. ETIM acknowledged responsibility for the attack on September 8, as well as for the attacks in Kashgar later that same July. Six men were handed prison or death sentences for their involvement in both attacks later in September. Adil Nurmemet (born February 1968) is a former Chinese politician of Uighur ethnicity. He was the Mayor of Hotan, an important city in the Xinjiang interior, between 2009 and 2013. He was investigated by the Communist Party of China's anti-graft agency in October 2014. Aksai Chin (Chinese: 阿克赛钦; pinyin: Ākèsài Qīn; Uyghur: ﺋﺎﻗﺴﺎﻱ ﭼﯩﻦ‎; Hindi: अक्साई चिन) is a disputed border area between China and India. It is largely part of Hotan County, which lies in the southwestern part of Hotan Prefecture of Xinjiang Autonomous Region in China, with a small portion on the southeast and south sides lying within the extreme west of the Tibet Autonomous Region. But it is also claimed by India as a part of the Ladakh region of the state of Jammu and Kashmir. In 1962, China and India fought a brief war in Aksai Chin and Arunachal Pradesh, but in 1993 and 1996, the two countries signed agreements to respect the Line of Actual Control. China National Highway 217 (G217) runs south from Altay, Xinjiang to Hotan, Xinjiang. It is 1,753 kilometres in length and runs southwest from Altay towards Kuqa County and from there southwards through the Taklamakan Desert to Hotan. The section between Dushanzi and Kuqa crosses the Tianshan Mountains and is commonly known as Duku Highway (独库公路). The Turpan–Hotan Expressway (Chinese: 吐鲁番—和田高速公路, Uyghur: تۇرپان-خوتەن يۇقىرى سۈرئەتلىك تاشيولى‎), commonly referred to as the Tuhe Expressway (Chinese: 吐和高速公路), is a Chinese expressway that connects the G30 Lianyungang–Khorgas Expressway at Xiaocaohu, in Toksun County, Turpan, with China National Highway 315 in Lop County, Hotan Prefecture. The expressway, designated G3012, is a spur of the G30 Lianyungang–Khorgas Expressway and is completely in Xinjiang. It is 1,931 kilometres (1,200 mi) in length. The expressway is fully complete from its northern terminus in Toksun to Yecheng and from Karakax County to its southern terminus in Lop County, Hotan. Only a section from Kargilik to Karakax County remains to be built. Eventually, the southern terminus will connect with the western end of the G0612 Xining–Hotan Expressway, which is currently in planning. Hotan Airport (Chinese: 和田机场; pinyin: Hétián Jīchǎng; Uyghur: خوتەن ئايرودرومى‎) (IATA: HTN, ICAO: ZWTN) is an airport serving Hotan, a city in the autonomous region of Xinjiang in China. Hotan County is a county in the southwest of the Xinjiang Uyghur Autonomous Region and is under the administration of the Hotan Prefecture. 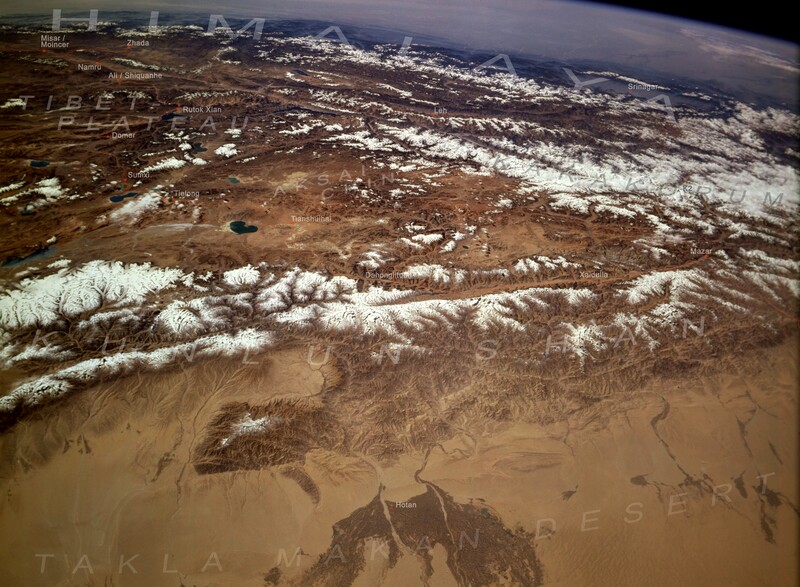 The southernmost county-level division of Xinjiang, it contains an area of 41,128 km2 (15,880 sq mi). According to the 2002 census, it has a population of 270,000. India claims a portion of Hotan County as Aksai Chin. Hotan Prefecture is located in the south-western part of the Xinjiang Uyghur Autonomous Region, bordering the Tibet Autonomous Region to the south. It is sometimes (unofficially) spelled as Khotan. Moyu County (Chinese: 墨玉县) as the official romanized name, also transliterated from Uyghur as Karakax County (Uyghur: قاراقاش ناھىيىسى‎; Chinese: 喀拉喀什县), is a county in the Xinjiang Uyghur Autonomous Region and is located in the southern edge of Tarim basin, it is under the administration of the Hotan Prefecture. It contains an area of 25,667 km2 (9,910 sq mi). According to the 2011 census it has a population of 577,000 and 98,1% are Uyghurs. Kunyu is a county-level city in Xinjiang Uyghur Autonomous Region, China. It is geographically located in Hotan Prefecture of southern Xinjiang, but is directly administered by the Xinjiang regional government.The city was formerly the settled and cultivated areas of the 224th Regiment of the 14th Division of the Xinjiang Production and Construction Corps (XPCC). In January 2016, the State Council of China approved the establishment of Kunyu City, and it was officially established on 26 February 2016. It covers an area of 687.13 square kilometres (265.30 sq mi), is located 78 kilometres (48 mi) from Hotan city, and is known for its Hotan dates. Minfeng County (Chinese: 民丰县) as the official romanized name, also transliterated from Uyghur as Niya County (Uyghur: نىيە ناھىيىسى‎; Chinese: 尼雅县), is a county within the Xinjiang Uyghur Autonomous Region and is under the administration of the Hotan Prefecture. It contains an area of 56,726 km2 (21,902 sq mi). According to the 2002 census, it has a population of 30,000.The county seat is in the town of Niya, which is often referred to by the county name (Minfeng) as well. The Niya ruins are located 115 km north of Niya Town of this county. Pishan County (Chinese: 皮山县) as the official romanized name, also transliterated from Uyghur as Guma County (Uyghur: گۇما ناھىيىسى‎; Chinese: 固玛县), is a county within the Xinjiang Uyghur Autonomous Region and is under the administration of the Hotan Prefecture. It contains an area of 39,412 km2 (15,217 sq mi). According to the 2002 census, it has a population of 220,000. Pishan was the site of the 2011 Pishan hostage crisis. Qira County, or Cele in Chinese, is a county within the Xinjiang Uyghur Autonomous Region and is under the administration of the Hotan Prefecture. It contains an area of 31,590 km2 (12,200 sq mi). According to the 2002 census, it has a population of 130,000. Tianjin Airlines Flight 7554 (Chinese: 天津航空公司GS7554; pinyin: Tiānjīn Hángkōng Gōngsī GS7554) was a scheduled passenger flight between Hotan and Ürümqi in China's Xinjiang Autonomous Region. The aircraft operating this route on 29 June 2012, an Embraer 190, took off from Hotan at 12:25 pm; within ten minutes, six ethnic Uyghur men, one of whom allegedly professed his motivation as jihad, announced their intent to hijack the aircraft, according to multiple witnesses. In response, passengers and crew resisted and successfully restrained the hijackers, who were armed with aluminum crutches and explosives. The aircraft turned around and landed at 12:45 pm back in Hotan, where 11 passengers and crew and two hijackers were treated for injuries. Two hijackers died from injuries from the fight on board. The Xinjiang government classified the incident as terrorism. The Civil Aviation Administration of China (CAAC) reviewed Hotan airport's security measures and airport security was escalated in Xinjiang. The incident marked the first serious hijacking attempt in China since 1990, and the first fatal hijacking or attempted hijacking since the September 11 attacks. Yutian Airport is an airport scheduled to be built in Yutian County, Hotan Prefecture, Xinjiang, China. The construction budget is CN¥710 million.The airport will have a runway that is 3,200 metres (10,500 ft) long and 45 metres (148 ft) wide (class 4C), a 3,000-square-metre (32,000 sq ft) terminal building, and four aircraft parking aprons. It is designed to serve 180,000 passengers and 400 tons of cargo annually. Yutian County (Chinese: 于田县) as the official romanized name, also transliterated from Uyghur as Keriya County (Uyghur: كېرىيە ناھىيىسى‎; Chinese: 克里雅县), is a county in Hotan Prefecture, Xinjiang Uyghur Autonomous Region, China. It contains an area of 39,023 km2 (15,067 sq mi). According to the 2002 census, it has a population of 220,000. Its government is located at Keriya Town.